As Kavinoky Theatre Artistic Director Loraine O’Donnell took the stage on opening night last Friday, she embraced theater’s time oldest cliché: the show must go on. “On February 24, it was our first read with all the actors. Everyone who was in Mockingbird, it just happened to work out that way. Tonight is 19 days later,” O’ Donnell said to a cheering crowd. When she found out they couldn’t do To Kill a Mockingbird, she met with the director and stage manager to figure out plan B, which turned out to be "1984," a play based off of the dystopian novel that sees most of the worlds population as victims of perpertual war and government servaillance. The usual process for planning a production for this size takes well over a year. One of the first things O’Donnell did was contact video designer Brian Milbrand, who was not part of Mockingbird. 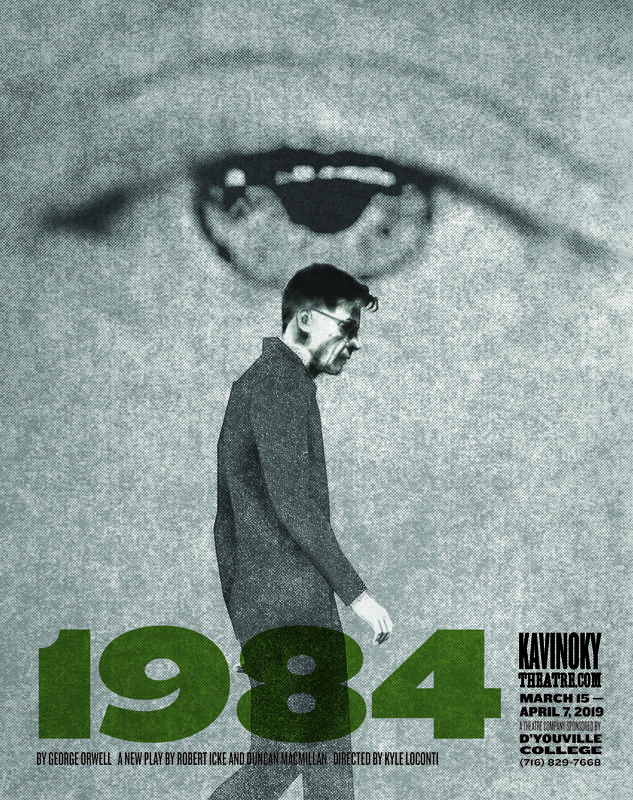 "1984" uses video throughout most of the show. Milbrand said they had to schedule multiple video shoots. Luckily for Milbrand, he worked on a production of "1984" almost a decade ago. “That was part of I think the good, part about it being '1984'. I thought through a lot of the issues that '1984' has. This is definitively a different script (than I worked on before), but it’s still like what is on the telescreen and what is that propaganda. I’d already sort of thought through some of that,” he said. And the screen at Kavinoky is not your typical formatted size. “We can configure them in any shape, but that makes it not 16x9. It’s actually more widescreen than 16x9. So there’s thinking about that. And then we shot almost everything in front of the green screen. So I had to key it all out, put in backgrounds and then there is a very heavy glitching effect throughout it. So it was a very effect heavy production,” Milbrand said. There wasn’t a role in ’1984’ for the kids casted for ‘To Kill a Mockingbird’, so O’Donnell said they put them in the show by including them in some of the videos. Milbrand credits working with director Kyle LoConti on making the entire process more enjoyable. “I’m still a little, obviously, sleep deprived and very caffeinated,” he laughed. Everyone else involved had spent months researching ‘To Kill a Mockingbird.' The transition for LoConti had her learning on the fly. LoConti said every moment she wasn’t at rehearsal she was trying to read the book. You didn't sign up for this. If you want to walk out right now, I will not bear any ill will towards you. I will totally understand. We'll call other people tomorrow. Everybody came up to me and said we will do whatever you need. Everyone. “We had already talked about scenes and blocked scenes. Then I got to the chapter in the book and I went, ‘Oh. That’s what’s going on.’ So then I’d have to come in and go, ‘Guess what I read last night?’ Not the position a director ever wants to be in. But thank god I had a cast that was facile,” she said. Playing the lead role of Winston was actor Chris Avery, who originally was supposed to play Atticus. For all the actors involved, Avery said it came down to focusing on their own fundamentals. “Just in terms of my training where I come from, it came back to specificity, given circumstances, make tactical choices and play them. And listen and respond. Just simple, simple things,” he said. Avery, like many others, had to memorize 50 some odd pages of dialogue in a matter of weeks based on source material they hadn’t touched since high school. So the cast relied heavily upon samples from the book to get in the right mood. “We’re using it all the way up until (two nights before opening night) when Kyle (LoConti) gave me a really beautiful specific note at the very end that was pulled from the book and it’s going to be a great choice,” he said. And ‘1984’ has a few non-technical elements that make the short turnaround even harder. LoConti’s concern was how the ambiguity within the play would be presented. Avery said the script itself is very precise in what it wants. With their backs up against the wall, Avery said they’re finding unique performances within themselves. I think somebody used the imagery of a phoenix and that's how it feels. We're rising up to the occasion and I think this is really good work. I'm proud of this. “Just finding these discoveries every single night. These little moments that pop up and they’re organic and they’re honest and they’re real. And everything that you want to get out of a full rehearsal period and you want in every single performance, we’re getting this just because it is so spontaneous and maybe that’s kind of the beauty of it, really is the spontaneity that we’re finding in these little moments as a company as a cast. Just the collaborative effort everybody has kind of put in to this,” he said. O’Donnell said she’s never felt more support in her entire life. That’s something that was made evident when she asked the Mockingbird staff if they were on board for ‘1984’. “You didn’t sign up for this. If you want to walk out right now, I will not bear any ill will towards you. I will totally understand. We’ll call other people tomorrow. Everybody came up to me and said we will do whatever you need. Everyone,” she said. For those involved who hope this is a once in a lifetime experience, resiliency reigns supreme at the Kavinoky Theater. Performances of the show run through April 7 on Thursdays, Fridays, and Saturdays. Buffalo's Kavinoky Theatre at D’Youville College has been forced to shut down its production of Harper Lee's To Kill a Mockingbird. WBFO's senior reporter Eileen Buckley says it's over a licensing dispute that has closed productions at small theaters across the country. WBFO's senior reporter Eileen Buckley says it's over a licensing dispute that has closed productions at small theaters across the country.